Each of the gardens we visited were amazing in their own ways. They were so very different and I was able to get so many ideas from each of them. This garden was so whimsical and fun. One thing about this garden that I didn’t notice right away is the lack of grass. Often in a garden with no grass something feels a little off, but this one feels very welcoming. Rebecca said that when she moved in the back was covered with a bed of mostly-dead Bermuda. What a transformation, it gives the rest of us a little hope. One thing that makes this garden so inviting is all of the archways. Here is the view as you first step into the backyard. The one here leads you into a cozy little seating area framed out with a cool chandelier. A lovely wrought iron bridge adds interest to another pathway. The free tumbled glass from the city makes up the river bed. Here’s a few pictures of some fun garden art, placed throughout the garden. My favorite of which is this pond/fountain which uses the watering can for recirculation. I loved the use of gates throughout the garden. Rather than just having them against a back fence they took center stage. I just bought a small gate this weekend when we were roaming around, and I’m about to go move it to center stage. The entire garden was very bird-friendly, with cute little houses and feeders everywhere. The garden also had bee, bat, and owl houses. I loved the idea of making the bird bath into a little bed. It is so unexpected. 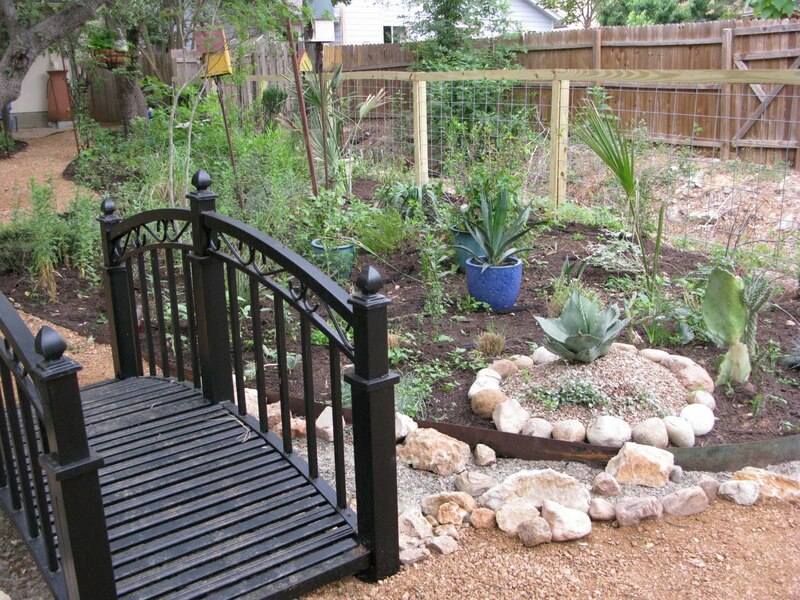 You can find this garden and and an interview with Link, the neighbor and creator on Central Texas Gardener. This garden is formed around this modern-style path. Link used a concrete saw to separate the plain old concrete path into these blocks and then created this geometric pattern. He did inform us that it was quite a bit of work, and not as easy as they make it out to be on the home and garden shows. Still, it was clearly worth the effort. The back seating area is framed out by these homemade screens. He used air-conditioner screens that he found on clearance at Target, with chain-link fence posts. Although they aren’t, they look extremely expensive, something you’d find in a high-end garden. This old piece of ranch equipment provides a window into the river bed. The bed is framed out with a lovely assortment of well placed grasses and salvias. There are also a few small trees. Link said that Wendy really likes a sparse garden, which in this case provides a nice zen feel. These rusted water heaters are such a cool idea. They really fit the space and could easily have ended up in a landfill somewhere. We had a chance to view Link’s garden next door, which has some of the funkiest yard art I’ve ever seen. He seems to be a master and sifting through items on bulk collection day and coming out with treasures. When I first saw these small machinery pieces, I thought they were some sort of succulent. My first time seeing a lawn mower on a pole. It is definitely an attention getter. I love it. 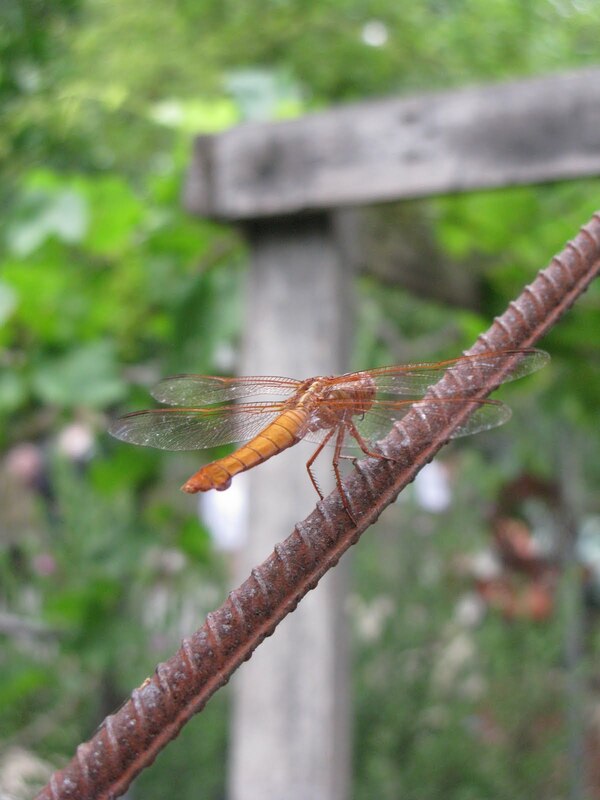 This rust-colored dragon fly looks like yard art. I’ll be posting on the other two gardens very soon. >It was a fun tour wasn't it?! So glad you could come – it was good to see you!